During this course, we will explore various different aspects of leadership that align to the range of values, knowledge and skills that leaders and managers need to possess to do their jobs effectively. 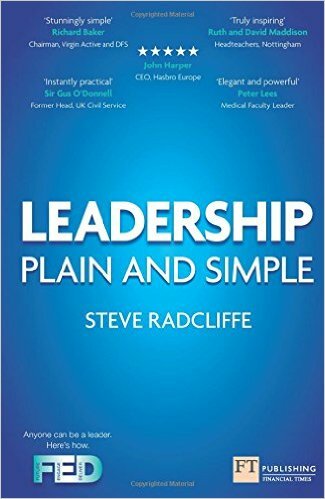 Section 1) What is leadership? Lots of words often spring to mind when try to define leadership: vision, values, direction, culture. Whilst there is a lot of hype around the role, it is generally accepted that great leaders are able to motivate and inspire their teams to achieve an ambitious vision. What do you want to lead for? Who is the leader you want to be? Idea: what's the simple strategy or vision? People: how do you attract, motivate and empower the best team of people to make your idea a success? Action: how do you deal with the day-to-day noise but keep pushing forward the idea, the priority? Through an extensive survey, the Gallup Organisation identified how some leaders had been very successful in creating a positive culture and a strong workplace. Consider the next twelve questions. Can you truthfully answer 'yes' to all of them? Does the mission/purpose of my organisation make me feel my work is important? Are my colleagues committed to doing quality work? In the last year, have I had opportunities at work to learn and grow? If you could answer yes to each question, it is likely that you have a strong workplace, where the best people will want to work and stay. Reviewing your responses to each of the twelve questions, what would you identify about your own organisation and how it may need to improve? What should leaders do to ensure that most staff can answer 'yes' to all of these questions most of the time? Based on in-depth interviews with more than 80,000 managers at all levels, Gallup reveal in 'First, Break All the Rules' what great managers do differently from ordinary managers to encourage world class performance out of their workers. 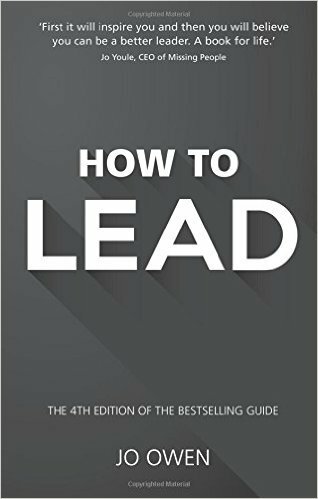 In this management bestseller, Gallup presents the findings of its massive in-depth study of great managers; some were in leadership positions while others were front-line supervisors. Some were in Fortune 500 companies; others were key players in small, entrepreneurial firms. Whatever their circumstances, the managers who ultimately became the focus of Gallup's research were those who excelled at turning each individual employee's talent into high performance. First, Break All the Rules - the book. The Leadership Pipeline Toolkit is aimed at middle managers in the further education and skills sector who aspire to be the future senior leaders in the sector. The toolkit includes resources on a range of leadership topics including: self-awareness, impact on others, seizing opportunities, overcoming and dealing with difference. The toolkit is located on the Foundation Online Learning and you will need to register to go through the modules - registration only takes a few minutes. To access this useful free resource please click here. The ELMAG portal was commissioned by The Education and Training Foundation in response to requests made by representatives from the sector. 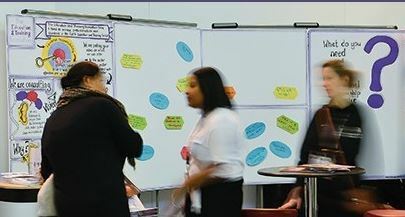 The portal aims to support the development needs of leaders, managers and those involved in governance across the Education and Training sector. The portal includes information about peer support, structured programmes, resources and assessment tools. A range of face-to-face and online training options for leaders are also available. 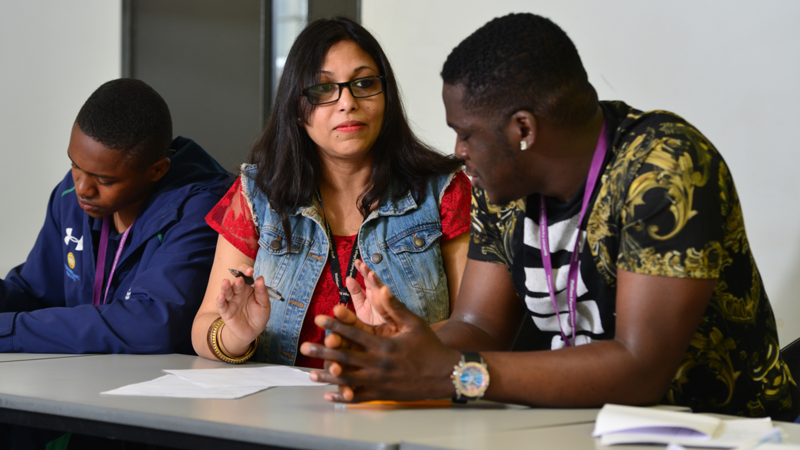 For more information and to access courses, please click here. what could you do in your role to improve the strength and vision of your organisation? what support would be helpful to you as you develop your leadership skills further? What are your next steps? are we becoming more emotionally intelligent? what cultures have the highest emotional intelligence? Can you match the definition to the four key elements of emotional intelligence? Drag the definition to the correct term on the left. The ability to interact and communicate effectively with the people around you. The ability to recognise other people's emotions and perspectives. The ability to take control and responsibility for one's own actions and behaviours. An understanding of one's own moods and feelings. "If you can keep your head when all about you are losing theirs and blaming it on you"
Good leaders are in control of their emotions. They are able to keep calm in a crisis to make the most appropriate decisions. They are also able to manage and respond to the emotions of others, to make them feel valued and secure. This emotional intelligence (EI) helps leaders to stay in control, develop resilience and maintain the motivation of their team. 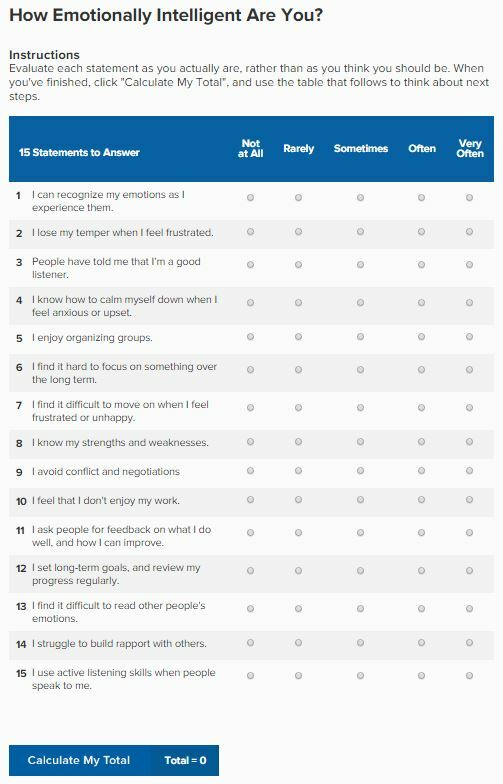 Visit the MindTools website to take this free short assessment of your own emotional intelligence. Having answered each of the 15 questions, select which band your total score corresponds to. So emotional intelligence is as much about understanding your own emotions, responses and behaviours, as it is about interpreting and responding to the feelings and emotions of those you work with. Developing a better understanding of ourselves and how other people see us, is a useful way of improving our own emotional intelligence. A variety of tools and strategies can help, including the 'Johari Window'. Try and match each of the four descriptors to the relevant quadrants of the window model. how might a developed awareness of emotional intelligence be useful in your current role? how might you further develop your emotional intelligence in the future? What are your next steps? Just think positive - that's the key right ? As an aspiring leader you will undoubtedly be expected to have clear vision, to solve problems and to overcome barriers in the achievement of the organisation's strategic and operational goals. When's things don't always go to plan remaining positive and optimistic is helpful but do great leaders need to do more than just think positive? 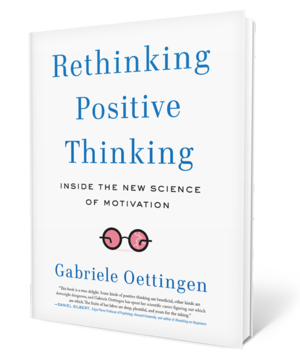 Over twenty years of research by Professor Gabriele Oettingen (2015) has identified that when faced with barriers to achieving our goals, we might need a little more than positive thinking. Let's take a look at mental contrasting and how 'WOOP' can help us achieve our goals more successfully. WOOP is an evidence-based, self-management strategy that people can use effectively on their own to change their behaviour and their habits. The approach has proven effective across professional and personal areas of life, helping people achieve their career and academics goals. Created as a result of over twenty years of scientific research, 'WOOP' is also known as Mental Contrasting with Implementation Intentions (MCII). It is a conscious exercise that builds non-conscious associations between future and reality and between the obstacles and the actions to overcome the obstacles. Research has shown that engaging in the WOOP strategy has helped people reduce stress and increase work engagement, find integrative solutions to problems, and improve time management. WOOP has four main steps which can be used to support different areas of behavior change. By using the WOOP strategy, you may become more motivated and skilled to take the necessary action. Use the drop-down menus to complete the WOOP steps. What is your most important academic WishOutcomeObstaclePlan or concern? Choose something challenging but achievable within the next month or so. What would be the best thing, the best WishObstacleOutcomePlan about fulfilling your WishOutcomeObstaclePlan ? What is your main ObstacleWishOutcomePlan that stands in the way of you fulfilling your Wish? What is it within you (an inner obstacle) that holds you back? What can you do to overcome your planwishoutcomeobstacle ? Name one effective action you can take. When and where will the obstaclewishoutcomeplan occur the next time? In this brief clip, Professor Gabriele Oettingen talks Dave Levin, from Character Lab, through the four steps of the WOOP process. As you watch the clip, try and identify what you feel is most useful about the approach. What is your most important academic wish or concern? Pick a wish that is challenging for you but that you can fulfil. Note your wish in 3-6 words. What would be the best thing, the best outcome about fulfilling your wish? How would fulfilling your wish make you feel? Note your best outcome in 3-6 words. Sometimes things don‘t work out as we would like. What is your main obstacle that stands in the way of you fulfilling your wish? What is it within you that holds you back from fulfilling your wish? Note your main obstacle in 3-6 words. What can you do to overcome your obstacle? Name one effective action you can take. Make the following Plan: "If… (Obstacle), Then I will …(action)". 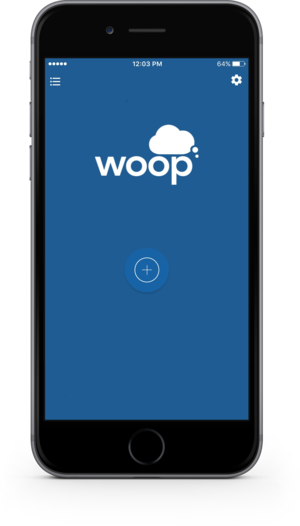 The WOOP kit gives everything you need to learn and use WOOP in your everyday life. You’ll find an overview of WOOP, the WOOP exercise in written and mental format, a checklist, FAQS, information on how to adapt your plans, and a WOOP card that you can use as a daily reminder. To access the free kit, please click here. The app allows you to save your goals and observe your progress. By teaching you the WOOP strategy, the app empowers you to sort out what is important in your day-to-day routine. how might you use a 'WOOP' approach in your current role? 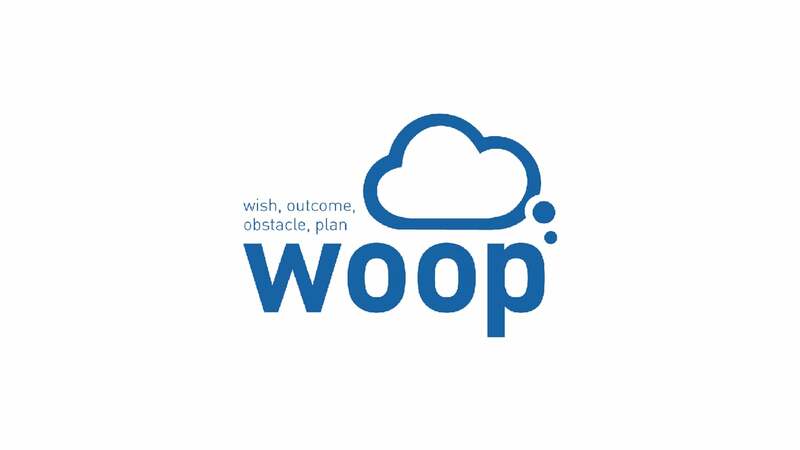 how could the WOOP App and Toolkit assist you in achieving your wish or goal? how could you go about using a simple 'If... Then..' approach to overcoming barriers you face in the future? What are your next steps? When making the move from middle manager to senior leader, the use of coaching and mentoring may be hugely beneficial in supporting your transition and skills development. Are coaching and mentoring the same thing and which approach might be most beneficial to you? Try and match the definitions to the most appropriate terms. "a relationship which uses a wide variety of behavioural techniques and methods... to achieve a mutually identified set of goals" (Kilburg, 1996). "a relationship between an experienced and a less experienced person to provide guidance, advice, support and feedback to the protégé" (Haney, 1997). Although often used interchangeably, coaching and mentoring can use some very different approaches. Coaching is always part of mentoring, but coaching does not always involve mentoring! Coaches share good practice with their Coachees but may not have had direct experience of the role and responsibilities faced by the Coachee. A good coach might not be a current senior leader. Coaching may take place over a shorter time-frame than mentoring and may tackle a very specific issue, problem or skill. For coaching to be effective, it must offer a high level of content knowledge,take into account the context in which learning is taking place, address the goals of the [organisation and their learners], and involve individual teachers in determining the direction their learning is to go (Joyce, Murphy, Showers, &Murphy, 1989). Like coaching, mentoring needs a trusting relationship between Mentor and the Mentee. Mentoring may be carried out over a longer time frame by someone who has direct experience of the role and responsibilities of the Mentee. For example, they may be an experienced senior leader who has faced very similar issues and experiences. Rather than looking at specifics, a mentoring approach may use non-judgmental listening to help the Mentee come to a new insight, perspective or decision. 0 = really not confident / lacking in skills to 10 = feel very confident/accomplished in this area. 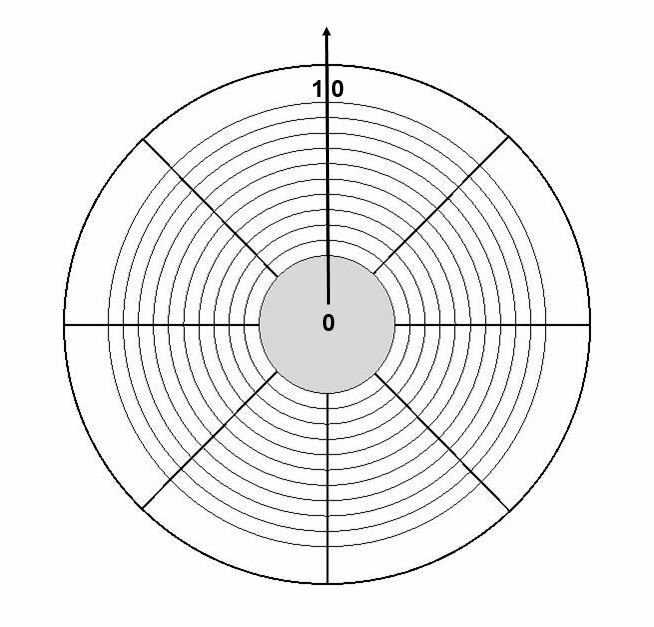 Now plot the points together to form a visual web. Which areas do you need to prioritise for your own development? How might you start your development in these areas? What sources of support are available to help you? Now that you have identified some areas where you may benefit from some support and development, it might be useful to use a coaching framework or model to work through your options and to identity your next steps. Three useful models are GROW, LEAP and PRACTICE. What would achieving this lead to long term? What stops you from moving on? What else? What else? and what else? What is it you actually want? How will things be different when you have achieved it? What would I do if I could not fail? What could I do if I had the time and resources? What’s the problem or issue or concern or topic you wish to discuss? The importance of active and purposeful listening is crucial in both a coaching and a mentoring approach. In 'Non-Directive Coaching' (Thomson, 2013), identified five different levels of listening. Try and order the different levels from the least to the most useful for the client. A number of different approaches to coaching, mentoring and consultation might be more useful for you to consider depending on your particular context and developmental needs as a new senior leader. Try and match the definitions to descriptions of six different approaches. would you benefit from a Coach or Mentor to support your leadership development? what would you look for in an effective Coach or Mentor for you? how could you go about establishing a trusting coaching or mentoring relationship? What are your next steps?